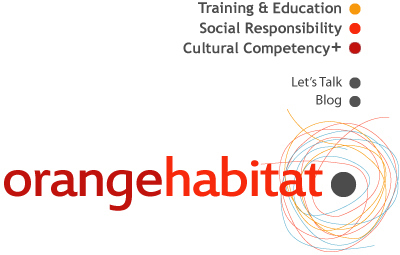 Orange Habitat specializes in organizational development and corporate trainings on social responsibility, cultural competency, diversity, inclusion and identity. Trainings are customized to the clients' specific needs and organizational culture. Investing in the well being and health of employees and work environments creates a huge asset for businesses and corporations that enrich their workplace culture and increases productivity. Drawing the Map (the 101): A 2-hour introductory session that explores your company's (or team's) composition, beyond the apparent identity presentations. This interactive session helps team members develop a better understanding of who they spend their work days with and why is it important to look beyond stereotypes and assumptions. Knowing Who We Are (the 102): A half day intermediate level exploration of your corporate culture and how it relates to a diverse employee structure. A mixed method session that will encourage everyone to better connect with their work environment and each other to achieve better productivity and cooperation. Planning Ahead (the 201): This full day interactive workshop goes beyond learning who we are and how we relate to each other (included in the day's curriculum) and delves into presenting challenges that teams might be facing within the existing corporate culture. The day includes a facilitated round table style session that allows team members and leaders to present and discuss these challenges and try to work on resolutions. Canada's diversity reflects on the composition of our client base and the way we provide services for them. 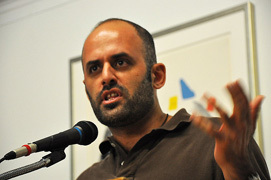 There is a profound need for service providers to understand the identities people carry with them, whether it was ethnic, social, gender based, sexual or political identities, or an intersection of some or all of them and beyond. Understanding where "clients" come from, as well as understanding your own social location as a service provider is key to providing services that are sensitive and appropriate. Introduction to "Identity": A two hour session that allows service providers, including board members and management teams to explore, question and challenge their knowledge of concepts of identity, labels and social locations. The Full Day: A 7 hour interactive workshop that goes deeper into learning who we are and how we relate to each other (included in the day's curriculum) and delves into presenting challenges that teams might be facing within the existing organizational dynamics. The day includes facilitated discussions that allows team members and leaders to present and discuss these challenges and try to work on resolutions based on better understanding of social locations and identities, within an anti-oppression, collaborative framework.